With Playstation Plus you can play online with friends, get free games and receive discounts on games from the Playstation store. The best feature of the Plus membership is playing online multiplayer with friends and players around the world. Right now the massivly popular Fortnite multiplayer game is available on the Playstation store. Never fight alone again with Playstation Plus. The Playstation Plus Membership code will be delivered online to your customer account in digital format. 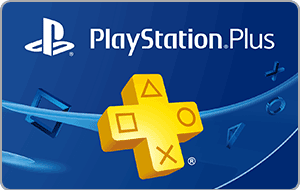 The code can be redeemed on your Playstation account will credit your account for 12 months of Playstation Plus. Orders are processed in a few minutes and some cases seconds, you will have immediate access to the Playstation membership code. The worlds most popular online multiplayer game Fortnite Battle Royal is available on the Playstation Store. With the Playstation Plus Membership there is an exclusive Plus offer the PlayStation®Plus Celebration Pack 2. The pack includes Exclusive Blue Striker Outfit and Exclusive Shift Back Bling.